When Karen Kerr of Karen’s Kitchen Stories set the November theme to use any root vegetable in our bake I thought “oh no just baked with potatoes last month!” What now?? Thought of carrots and couldn’t think beyond that. Thrice a week a vendor comes to our apartment complex to sell fruits and vegetables. He brings colocasia roots every time and I just tend to pass by them and pick up other vegetables. So this week, I actually stopped to buy the colocasia roots as now my mind had progressed from carrots to something different. By the way, if you want to learn how to use sourdough and make exotic and different kinds of breads then make sure you visit Karen’s site. She has an awesome collection. Colocasia roots, also known as taro roots, or as arbi in India, is a popular vegetable in many parts the world. Its known as arrowroot or nduma in Kenya, kalo in Hawai, or as dasheen. I personally have never made anything using these roots but have eaten curries made from them. So why not use it to make flatbread I thought. I use the taro leaves to prepare a popular Gujarati snack called patra. Colcasia roots are tap roots and known as corm. They are edible roots rich in starch, low in fat and gluten protein. Its a rich source of Vitamin B and minerals like potassium, iron, magnesium, copper and manganese. These roots cannot be consumed raw as they contain oxalic acid which is destroyed when the roots are cooked. The roots can be boiled, baked, steamed or fried. However make sure to oil your hands when handling raw roots as it can cause itchiness. I boiled the roots first to avoid this problem. In India the roots or corms are used to make dry vegetable preparations, curries, cutlets, fritters, flatbreads. The options are endless. I decided to add boiled and mashed taro roots to the dough to make flatbread. All households in the Indian Sub Continent make flatbreads whether roasted, baked, shallow fried of some sort everyday. Its an important part of any meal right from breakfast to dinner. There are so many varieties of flatbreads in India itself, some made plain, some lightly spiced, some stuffed and some with vegetables, fruits, dried fruits or nuts added to the dough. 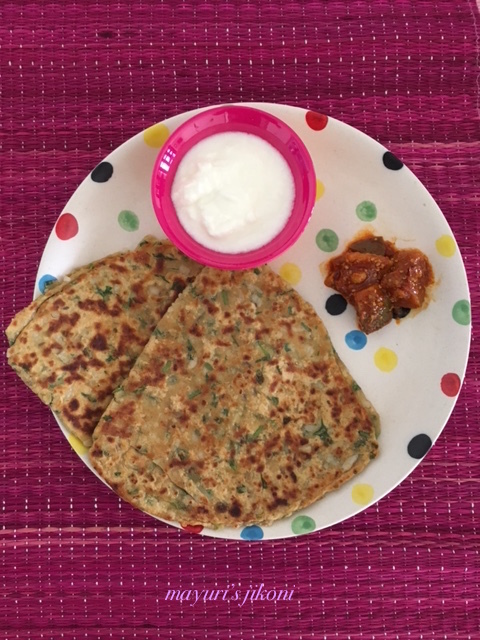 So here’s my preparation using a root vegetable (main is taro root and a little bit of ginger), a delicious spicy flatbread ideal breakfast treat with a cup of masala tea, some yogurt and pickle. Mix both flours, salt, asafoetida,carom seeds and cumin seeds in a big bowl. Add chopped coriander, chillis and ginger and mix well. Add the mashed taro or colcasia roots to the flour mixture. Mix everything together. The flour will be a bit wet. Add water and form a dough that is not too soft or hard. Lightly rub some oil on your palms and knead the dough till it becomes smooth. Cover and leave on the side for 15 minutes. Divide the dough into 6 parts. If it is very sticky, dust it with some flour. Dust one ball with flour and roll it into a 6″ diameter circle. Smear some melted butter or ghee over it. Smear melted butter or ghee over the half. Dust with little flour and roll the quarter into a triangle shape about 6″ from one point to the other. Place the rolled triangle on the hot frying pan or tawa. Cook till small bubbles appear on the surface. Flip and cook the other side for 1 minute. Smear some oil over the paratha or flatbread and flip it over. Cook till brown specks appear on it. Smear oil on the top part of the paratha or flatbread and flip over. Cook till brown specks appear and its a bit crispy. So basically both sides should have brown specks on them. Serve immediately with pickle, yogurt and hot cup of masala tea or coffee. Repeat steps 11 to 23 with the remaining dough. The steps may be many but making flatbread is actually pretty easy. Its like making french toast or pancakes which you cook on both sides on a frying pan. Most of the ingredients are readily available in most Indian stores and in the bigger cities they are available in the supermarkets. Replace the taro roots with potatoes, sweet potatoes, beetroots, carrots to make different sort of flatbreads. Adjust the amount of green chillis according to your taste. Boiled and mashed taro roots will appear sticky but once its added to the flour it will not be so sticky. If the dough becomes too soft, add a bit more wholewheat flour. I don`t know that vegetable. I love how to use it in the dough. I left my comment on the wrong post on your blog. I have never seen Taro root used and enjoyed your explanation of how to prepare it. Your flat bread looks delicious! I love the look of that bread. I started drooling when I saw the photo. That looks delicious! What a creative way to use taro root too! Also, thanks so much for the kind words. Made me smile from ear to ear. This paratha is new to me. My mom usually makes curry with this root……..
Never ever thought of using arbi in a paratha Mayuri. This is just genius. Will have to try this recipe some time soon.